A bag of Organic Lemons on sale!!!!! !…………on sale for $1.49!!!!!!! Too good of a bargain to pass up!!!! Oh no!! What do I do with a bag of Organic Lemons??? 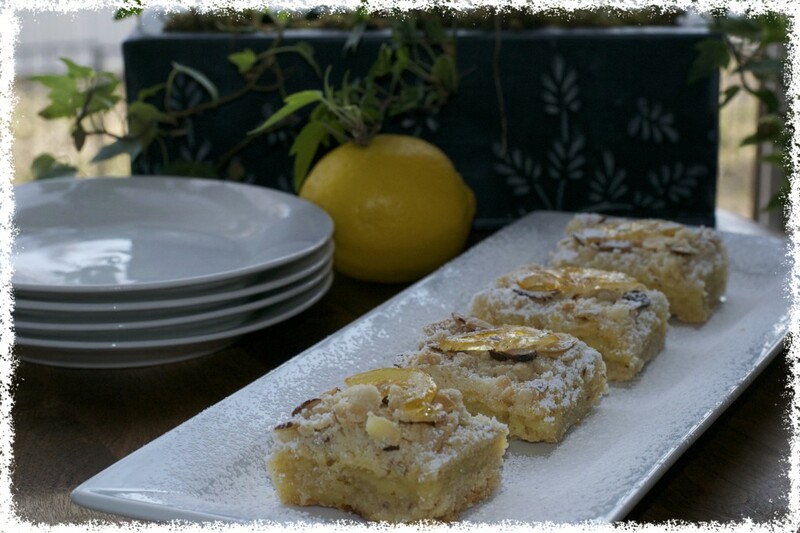 ?……….When life hands you lemons, at a bargain price ……..you make Almond Lemon Crumb Bars, of course! I must admit, I have not always liked lemon bars. Maybe the ones I remember from childhood were too artificial lemony, or maybe I just wasn’t a lemon lover. Well, times they do change………I love lemon, but it has to be real lemon! By real lemon I do not mean that little plastic lemon shape with juice inside, nor do I mean the big green bottle called real lemon. I mean, the buy it in the produce section, bright yellow, squeeze it yourself lemon. So, not wanting just a plain average lemon bar, not that they are not good, but I wanted to do something a little jazzier with my lemons. I like a crumbly crunchy topping on…….well almost anything, but on a dessert bar it’s the bomb! 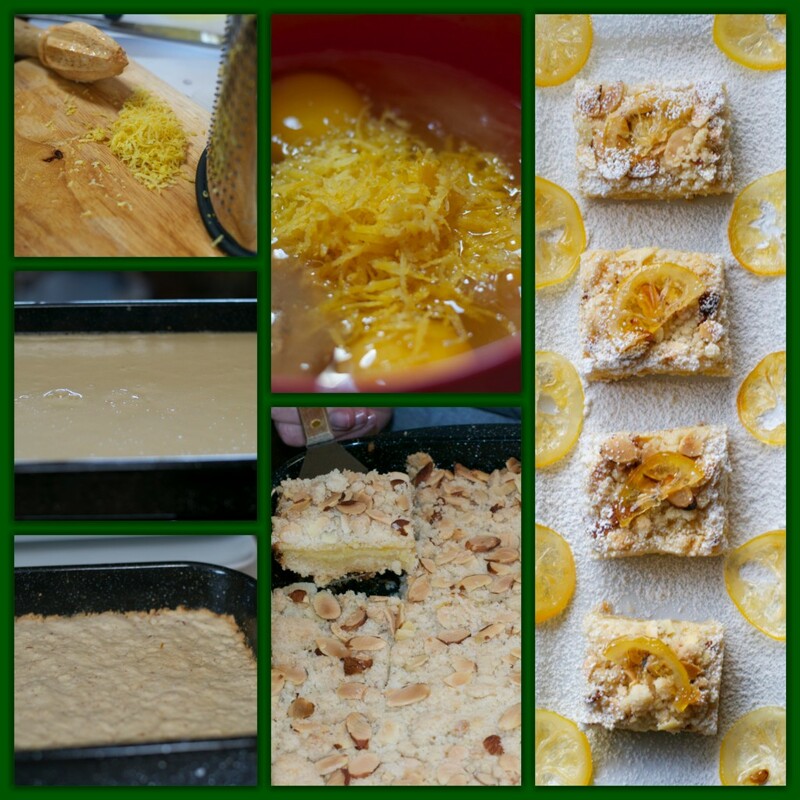 A nice cookie crust with just a hint of almond flavor, a soft silky center with just the right amount of lemon, and the crunchy topping with sliced almonds. Now, Tim and I are really trying to do the healthy thing……with moderate success. So instead of us eating the whole pan, I bestowed my Almond Lemon Crumb Bars on our neighbors and my co-workers. I saved us each one bar………OK two, but they were really small……but at least we didn’t eat the whole pan………now if we could just learn to drive by the Dairy Queen…..LOL. Spray a 9″x 13″ baking pan with non stick cooking spray or line with parchment paper. With a mixer on medium speed, beat butter, sugar, and lemon zest until light and creamy. Reduce mixer speed to low. Gradually add flour and salt, mixing until dough is crumbly but holds together when pinched. Press dough evenly and firmly into prepared pan. Chill 10 to 15 minutes. Bake 15 to 20 minutes, or until lightly browned. Set aside. Mix flour and ginger in the bowl of a food processor. Process until ginger is finely chopped (about 1 minute)if using crystalized ginger. Stir in baking powder. Whisk together eggs and sugar. Add flour mixture, and mix until combined. Stir in lemon juice and zest. Pour filling mixture over crust. Bake 15 to 20 minutes, or until filling is almost set. Remove from oven and set aside while making the topping. Combine flour, sugar, and salt. Stir in melted butter, mixing well. Stir in almonds. Sprinkle topping mixture evenly over filling. Gently press into the filling. Return to oven and bake 20 to 25 minutes, or until lightly browned and almonds are lightly toasted. Cool bars completely in pan on a wire rack before cutting into bars. 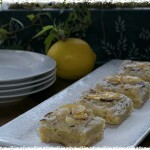 Decorated with candied lemons, or sprinkle with powdered sugar if desired. *You can substitute 2 teaspoons of ground ginger and 2 teaspoons of powdered sugar , mixed with 2 teaspoons of water in place of crystallized ginger. Do not mix add to flour mixture but add with wet ingredients. Serving size of 24 is based cutting 2 inch bars.